A few years ago Jack R Christianson had the opportunity to teach seminary at Timpview High School in Provo, Utah. He was excited to begin a new year, and looked forward with great anticipation, to what the future held. He was somewhat apprehensive, however, about going to Timpview, because it would be his first experience of teaching or attending school without spending his afternoons playing football, baseball, or coaching. He knew he could do it, but he worried nevertheless. That is why he enjoyed pep assemblies so much. It was an opportunity to feel many of the same feelings he had had as a player and as a coach. You have probably had the same experience—chills running down your arms and the back of your neck, when you enter the gymnasium while the band is playing and the cheerleaders are cheering. It’s exciting! He remembered one particular assembly before a big game. The cheerleaders had planned a special class competition involving cream pies. Some of the athletes, you know the type, the ones who all sit together, and won’t cheer except on rare occasions, got an idea to liven things up by throwing some of the pies at the cheerleaders. Somehow the activities the cheerleaders had planned were left in a barrage of pies being thrown, hairdos being ruined, and the student body cheering for the athletic culprits. It was quite an experience. Very little was said to these young men, by the cheerleaders. Each girl allowed the boys to think they had really gained the upper hand and gotten away with a fast one. The pies were soon forgotten, and another pep assembly greeted them a few weeks later. This time, as everyone entered the gym, there were 12 caramel apples on center court. 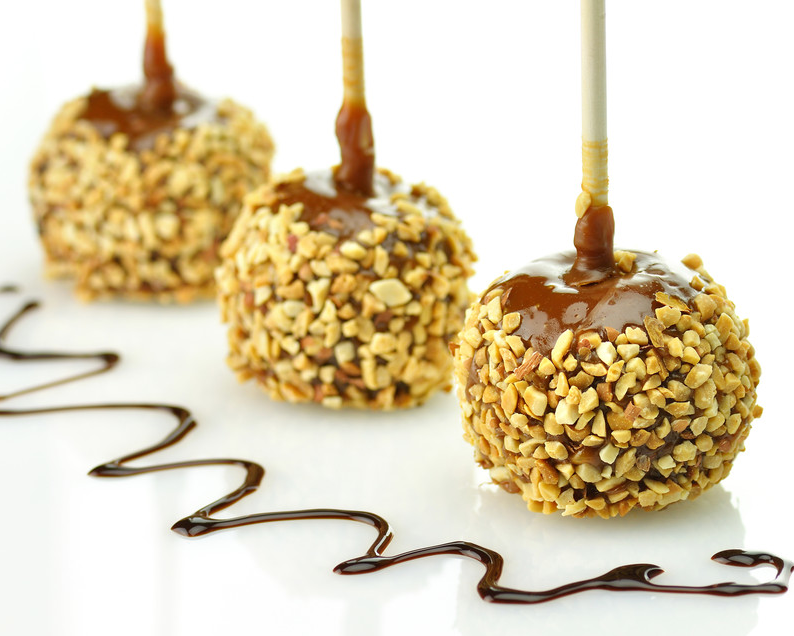 Big, beautiful, brown caramel apples, waiting for someone to eat them. When everyone was settled down, and the band had ceased playing, the head cheerleader walked to the microphone. She began to explain that morning’s class competition. From the small piece of paper, she read the names of six football players and challenged them to a candied-apple-eating contest. As each name was read, the responding young men came down to the basketball court with confidence, raising his hands as if in triumph, knowing that he could eat an apple faster than any girl. Jack and another teacher were called upon to judge this historic event. The cheerleaders explained the rules to Jack, and he then explained them to the young men. The young men, however, were not overly concerned, because each was proficient in eating and eating quickly. The only two rules were (1) every apple on each team must be completely devoured and (2) the girls were to be allowed a ten-second head start. After hearing the rules, the young men decided on a game plan: they would not chew—just bite, swallow, bite, swallow, until each apple was gone. With such strategy, the contest began. The whistle blew, and the girls began to eat with great care and deliberate actions. The boys, on the other hand, stood watching, waiting for their winning opportunity. When the second whistle blew, each young man, without any hesitation or forethought, lunged toward the caramel apple before him. With no table manners evident, they began to devour them with great haste—bite, swallow, bite, swallow. Then suddenly, in unison, as if a light switch had been turned on inside each boy, heads raised in shock and disbelief as they realized they were not eating candy covered apples but candy-covered onions! The crowd roared when they realized what had happened. The cheerleaders, on the other hand, stood calmly, hands signaling the peace sign in recognition of their sly plan to deceive the football players. By now these poor boys were looking as white as sheets, and trying to get rid of the large bites of raw onion which were now floating throughout their systems. Those poor guys smelled like onions for quite some time, and it was not an easy task to rid themselves of the stench. Since then, Jack has told that story hundreds of times while speaking about music and its effect upon our actions, feelings, thoughts, and spirituality. In doing s,o he has thought very seriously about what happened that day at Timpview High School. The cheerleaders had made the onions appear so much like the apples, that the football players could not tell the difference until the onions became a part of them and it was too late. No one ever dreamed that those “sweet” young ladies would be so mischievous as to use something these young men loved so dearly—food—to get back at and deceive them. When you ponder this story ask yourself, “Would Satan try to do the same thing to deceive us?” Would he use the things we love the most to deceive us and bring us down to destruction? Could he even use music, which most of us love dearly, to deceive us? Satan is the champion of all liars and does not care one bit about you or me. His only desire is to seek our misery. Of course he would use music! Without question, he knows that music is one of God’s greatest tools for good that was ever created. He must be aware that it is one of the most important and powerful influences in our lives. So, if he has this knowledge, don’t you think he could use music as one of his greatest counterfeits of all time? After all, isn’t listening to music one of the first things we do each morning, one of the first things we do when we get into a car, and one of the last things we do before we go to bed at night? Actually, everywhere we go, from the doctor’s office to the supermarket, music is being programmed into our systems. Whenever God creates something that is good, true, and beautiful, Satan, in his devious way, comes up with something that is false, counterfeit, and ugly, yet appears to be similar to our Heavenly Father’s creation. He acts, if you will, in much the same manner that the cheerleaders did with the onions. He tries to deceive us into partaking of that music which is false, counterfeit, and ugly in hopes that we will not detect it until it is a part of us or too late altogether. Now the question is, how do we choose between the musical apples and the musical onions? Between the good, the true, the beautiful, and the false, the counterfeit, the ugly? Satan has done so well in caramel coating some of his music that distinguishing “apples” from “onions” is sometimes difficult. The Lord in his infinite wisdom allows us to make decisions on our own, yet leaves us responsible and accountable for the decisions we make. Whether those decisions are for our betterment or our destruction, we must be responsible for the consequences. In the scriptures, we have been given a way to discern Satan and his counterfeits in all aspects of our lives. From the scriptures we learn how we can judge the difference between musical apples and musical onions. “Wherefore, all things which are good cometh of God; and that which is evil cometh of the devil; for the devil … inviteth and enticeth to sin, and to do that which is evil continually. “But behold, that which … inviteth and enticeth to do good, and to love God, and to serve him, is inspired of God. “… the Spirit of Christ is given to every man, that he may know good from evil; wherefore, I show unto you the way to judge; for everything which inviteth to do good, and to persuade to believe in Christ, is sent forth by the power and gift of Christ; wherefore ye may know with a perfect knowledge it is of God. I don’t believe this scripture is saying that all “good” music must be of a religious nature or even that all music can be divided neatly into a holy or evil category. However, If our music persuades us “to do evil,” to “believe not in Christ,” or to “deny him,” or “serve not God” in any way, we should not be partaking of it. If it inhibits the Spirit of the Lord, it is not worthy of us. You must decide for yourself whether you will listen to “onions” or to “apples.” The decision is not an easy one. However, as the poet Robert Frost put it, “Two roads diverged in a wood, and I, took the one less traveled by, and that has made all the difference” (“The Road Not Taken,” lines 18–20). Thank you Jack R. Christianson for sharing this experience.